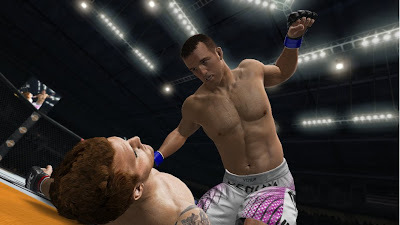 UFC Undisputed 3 is the 2012 installment in the critically acclaimed and best-selling mixed martial arts (MMA) video game franchise based on the Ultimate Fighting Championship. Yuke’s and THQ return after a year was spent perfecting UFC 3 Undisputed, but does it fall short in the first round? There are quite a few changes that help progress the game forward, mainly the fixes to the submission system, this new system rewards skill rather than how fast one could rotate their controller stick. The addition of more in depth tutorials also helps cater to the newcomers or those scared away by the previous games. Pride Mode is a great new part of the franchise and certainly is refreshing. Career Mode got a facelift, now focusing more on getting you into the fights and less on fatigue management and stats building. Among those big changes the general fixes also helped keep the game a cut above the previous titles in the series. The massive roster of over 100 fighters will also help keep things interesting. There are tons of new additions, but this franchise is already starting to show its lack of progression. Unfortunately the UFC is a finite experience there is only so much that can be changed while sticking to the confines set by MMA. It has become friendlier to those interested but this same simplicity might scare away the core gamers. Load times are still excessively long and far too often I have spent more time in my Career Mode at load screens than actually fighting. Pride Mode was a welcomed addition, but was largely underplayed leaving a huge gap in potential. Like previous titles the commentary gets rather repetitive after about a handful of fights. One final personal complaint came in the realm of blood effects, especially when compared to the dated EA Sports MMA. While they have added some new effects the lack of blood smearing effects is mind boggling and really holds the game back from truly immersing people, myself included. 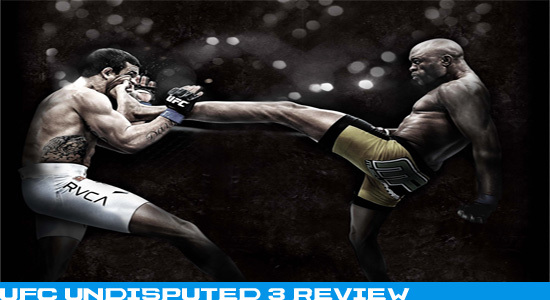 UFC Undisputed 3 has no real challenge, they have cornered the market of MMA much like EA did with NCAA and the NFL. This however may be their biggest downfall, because the title is already starting to lack ingenuity 3 games in. This does not make it bad though, Undisputed 3 is an amazing game. It will certainly win awards and the improvements to the limb mechanics and physics engine were certainly noticeable. My hopes are that EA continues to challenge Yuke’s with MMA titles, but I do not see this happening, so much like Madden I think we may start to see a decline in quality soon enough. If you were a fan of the previous titles then I would definitely recommend this those for sixty bucks not much new content has been added seeing as Pride Mode was underutilized. Newcomers however this is the perfect time to jump in so if you were ever interested now is the time to step into the octagon.